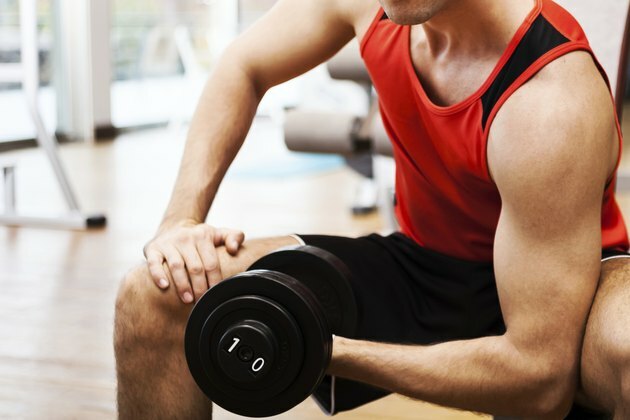 Why Do You Get a Burning Sensation in Your Muscles During Strenuous Exercise? Whether you're lifting weights or using your own body weight as resistance, completing repetition after repetition often causes a burning sensation in the isolated muscle. Since the burn you feel in your muscles has nothing to do with burning fat, it's not helping you to lose weight, but acts as an indicator of the effectiveness of an exercise. When you exercise and isolate a muscle group, lactic acid, produced naturally by your body, begins to build around that muscle. As the lactic acid surround the muscle, it results in a burning sensation. While the burn is often associated with becoming stronger, the feeling of heat and fatigue often ends your workout. After a certain number of repetitions, the lactic acid causes muscle fatigue as it interacts in the calcium in your body. This is evidenced by your inability to complete any more repetitions. You put yourself at risk for searing muscle pain when you lift more than you're used to. Heavier weights or extended repetitions cause the release and buildup of lactic acid, which occurs quickly. Your muscles begin to burn after even a few reps when you're moving to a heavier weight. Avoiding a proper warmup before exercising also speeds the collection of lactic acid, meaning your body and muscles tire faster and you won't be able to do as many reps without the sensation. The best way to stop the burning sensation altogether is to stop the exercise. When your muscles become so fatigued and clotted with lactic acid, this will happen naturally as you end your reps. You'll notice that the burning sensation quickly dissipates when you're finished. Unfortunately, the muscle fatigue and burning sensation can translate to delayed-onset muscle soreness. This is the symptoms that you face the next morning when your muscles are stiff and sore after a workout. Stretching properly after a strenuous workout can reduce some of this pain, along with over-the-counter pain medications. The concept of "burning fat" or "feeling the burn" usually isn't related to muscle pain, but rather body fat. The idea that fatiguing muscles can burn fat is simply incorrect. When your muscles burn during exercise, it acts a general indication of the effectiveness of the exercise, without causing an actual positive reaction in your muscles. Instead, muscle is built when you sustain resistance training. Do You Need to Feel the Burn When Exercising? Why Do Your Thighs Burn on a Bicycle?